In the of post-Napster, iTunes era of iPods, satellite radio, and streaming your own playlists online threatening to close out CDs let alone records, we've become so inundated with the availability of music that it's easy to take it for granted. Moreover, this is now and has always been doubly true for American listeners, as -- even in rock music's '60s heyday -- we were privy to 571 radio stations blaring the music we loved 24/7 whereas across the pond and at the height of the British Invasion, the very country that brought us The Beatles could only listen to rock 'n roll for two hours every single week. In Britain, big bands were still in vogue on the airwaves, which was in stark contrast to what was perceived as the amoral vulgarities of your typical rock song. Yet in order to give over twenty million citizens what they were desperately craving, some brave disc jockeys spun records “all day and all of the night” on docked boats just outside of the government's jurisdiction. 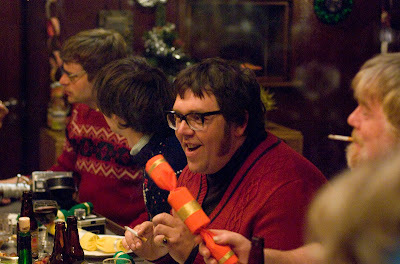 The rock version of The Untouchables, writer/director Richard Curtis' follow-up to Love Actually is an affectionate love letter to the importance of soul feeding music and its 1966 seamen champions in the form of a rough, rag-tag egomaniacal group of DJs who make Cusack in High Fidelity seem like a poser. 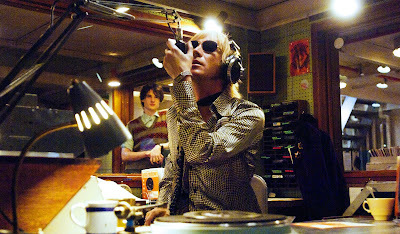 Forever battling “the man” on land with rhythm and blues, we're initially introduced to the guys who live by the microphone and die by the record player needle as if we were awestruck fans like our main character, the teenage Carl (Tom Sturridge). 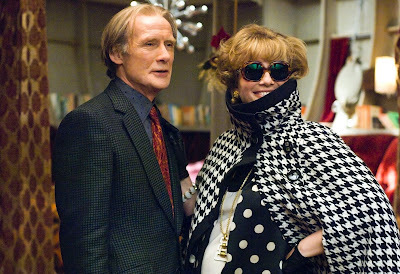 After getting in trouble at school, Carl was packed up by his mother Emma Thompson for some important male bonding time with his Radio Rock station manager godfather Quentin (Bill Nighy). 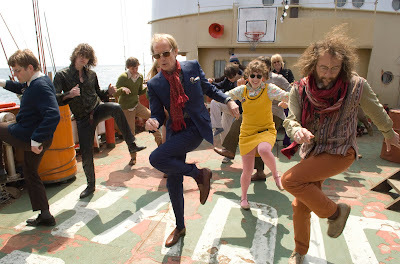 Admittedly, amidst the partying, no holds barred boat that rocks (as the film was called overseas), Carl seems confused as to why she thought he'd ever be straightened out among such larger than life characters as Philip Seymour Hoffman's Count, Rhys Ifans Gavin, Nick Frost's Dave and others. But when Thick Kevin has a rare moment of clarity, he informs the lad that mom's reasoning may have had something to do with Carl's need to spend some quality time with the long lost dad whom he can't yet identify. 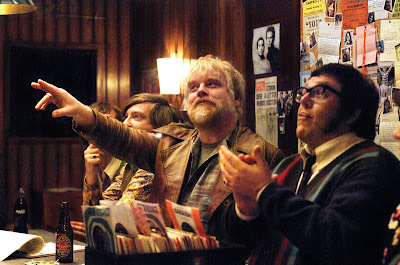 Although it's fairly easy to liken the historically inspired film to Almost Famous due to its larger than life ensemble cast of characters in a period setting we take in through the eyes of a young man – not to mention the fact that they both share actor Hoffman -- Pirate Radio isn't quite as emotionally potent or nostalgic as that title. Instead, it seems to be going for a rough around the edges vibe that pays off beautifully considering how so many ego-driven individuals manage to coexist in the same claustrophobic location without harming anyone more than they do themselves after a game of chicken goes hilariously wrong. Quintessentially Curtis in flavor, it harks back to his earliest famous screenplays such as the one for Four Weddings and a Funeral that kicked off his career in terms of a large cast and linking events together a la Love Actually. This is particularly evident as we discover that the no-nonsense government suit Kenneth Branagh is on a mission to destroy Radio Rock for good. Overall, the movie is a true sleeper that will hopefully gain a wider audience on disc as -- just like music -- it picks up momentum as a word-of-mouth campaign of cool. 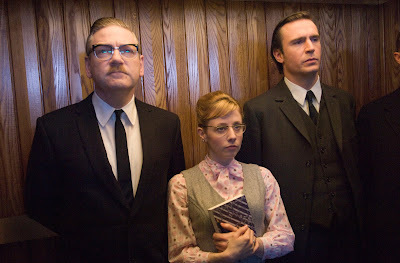 Unfortunately given the disservice of a title change from The Boat that Rocked to Pirate Radio here in the States rather late in the game and opening months after it was expected in theatres, it's easy to see why it never caught on as I don't recall seeing a single ad for it prior to its release. Yet much like another surprise feal-great musically inclined picture of another feather Bandslam, it's a truly lovable discovery. In whittling down their original playlist of 200 tracks, wall-to-wall music spins throughout the roughly two hour running time and includes everything from The Kinks to Dusty Springfield to The Who to The Beach Boys set to vivacious Rowan and Martin's Laugh In meets American Bandstand meets Truman Show style cuts of dancing, riveted listeners all captured via montage, split screen and more. To this end, it's infectious and irresistible enough to make you long to seek out a playlist of all of the songs considered for final cut. 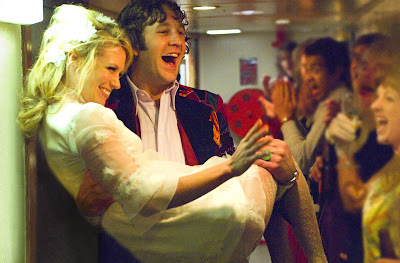 Admirably avoiding the urge to move in a sentimental Cameron Crowe direction when it came time for Carl to lose his virginity and later deduce who his father is among the motley crew along with their own squabbles, Curtis – who was inspired by M*A*S*H*, National Lampoon's Animal House and Blackadder -- ensures that it stays true to the rock 'n roll fast paced lifestyle via a delicate balance of emotion with some pretty surprising turns of events. While I still have an overall weakness and personal connection with Famous and as a critic, am more the “professional appreciator” type a la High Fidelity than a disc jockey, there's a whole lot of magic in this crisply transferred Blu-ray. 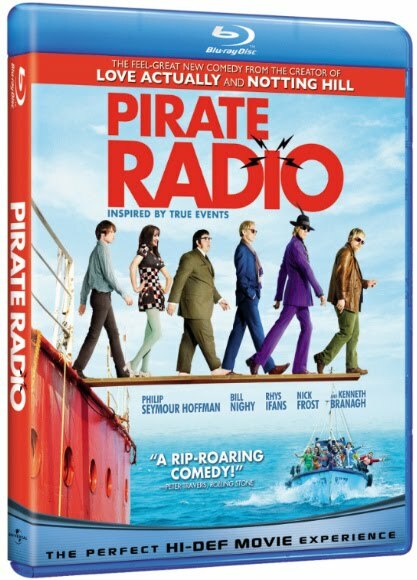 And filled with featurettes and BD-Live extras, this all comes across brilliantly both in the speaker rocking musical selections and the rather inviting, instantly smile inducing camaraderie evidenced onscreen that makes you feel like one of the crew aboard Radio Rock.